For many people in and around Nashville, the flooding Thursday has been round two after the devastating May 2010 flood. There are many important things to keep in mind about what to do if you need help. First, regarding health and safety, the Tennessee Department of Health has tips if you have been affected by flooding. Wear sturdy shoes or boots, long sleeves and gloves when handling or walking on or near debris. Check outside the building for downed power lines or gas leaks. If you find any, call the utility company immediately. Gas leaks will have an odor like rotten eggs. Never touch or try to move downed power lines yourself. Check the building's foundation for cracks, and inspect porch roofs and overhangs to ensure they are adequately supported. If any part of the foundation has been damaged, it may not be safe to enter the building. If you find severe damage, ask a building inspector to check the facility before you go inside. Look before you step. Floors and stairs may be covered with debris and mud-covered surfaces may be very slippery. Watch out for broken glass, nails and other hazards. If the building has been closed up for several days, enter briefly to open doors and windows and air it out for at least 30 minutes before you stay for any length of time. Be alert for gas leaks. Do not strike a match or use an open flame unless you know the gas has been turned off and the area has been ventilated. Use a flashlight to look for damage. Turn off the power supply to the building, even if the power company has turned off electricity to the area. If you must enter standing water to access the main power switch, call an electrician to turn it off instead. NEVER turn power on or off yourself or use an electric tool or appliance while standing in water. Do not use appliances or motors that have gotten wet unless they have been taken apart, cleaned and dried. Watch out for animals, especially snakes. Small animals that have been run out of their homes by severe weather may seek shelter in yours. Do not use generators or other gasoline-powered machines inside. All cooking on camp stoves and charcoal grills should be done outside. Carbon monoxide fumes from these devices can be deadly. Practice good hygiene, washing hands frequently with soap and clean water. If clean water is not readily available, alcohol-based hand sanitizers can be used. When in doubt, throw it out. Flood water picks up numerous contaminants from roads, farms, factories and storage buildings, including sewage and chemicals. Many flooded items such as wallboard and mattresses cannot be completely cleaned of mud and contamination. Spoiled food, wet cosmetics and medicine are also health hazards and should be discarded. Hose the house. Mud and silt left behind by flood water can pose a risk for disease. Shovel as much mud as possible out of the building and hose it down inside and out. If you receive a puncture wound contaminated with feces, soil or saliva, contact your health care provider to determine if you need a tetanus booster vaccine. Seek medical care if you are injured, sick or having trouble coping with stress. For more information on safely returning to weather-damaged homes and businesses, visit http://emergency.cdc.gov/disasters/. 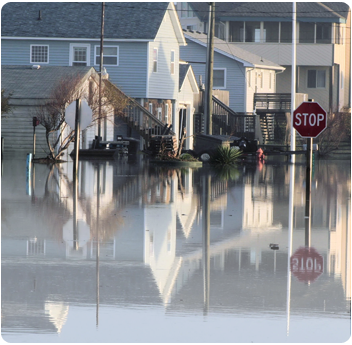 Insurance experts advise that flood insurance is separate from homeowner's insurance. That is a huge distinction to make, because homeowner's doesn't cover flooding. For people with flood insurance, you should prepare to file a claim by gathering policy numbers and contacting your insurance agent or provider no matter the level of damage. Your personal level of damage doesn't matter. If you have stuff damaged, call immediately. If you have to make temporary repairs, look for holes in the roof, walls, windows or other places that more damage could be done to your home. Cover the site with boards, plastic, etc. to prevent additional damage and save all receipts for stuff like this, because you can be reimbursed. Make a complete inventory your home by taking photos of damaged items and writing a list of all damaged items. That will help the adjuster who comes to evaluate your claim. Do not throw away damaged items until they have been inspected and evaluated. If you need to throw away carpet or upholstery, always save a sample of the damage. If you do not have flood insurance or have questions about what your homeowners or renters insurance covers, please contact us. Finally, the American Red Cross has opened an emergency shelter to assist those who have been affected by the flash floods. The Red Cross encourages anyone coming to an emergency shelter to bring the following items for each member of their family: any prescription and emergency medications, extra clothing, pillows, blankets, hygiene supplies, important documents and other comfort items. It is also important not to forget special items for children, such as diapers, formula and toys, and other items for family members who have unique needs. If you would like to help the recovery, call 1-800-RED CROSS or texting the word REDCROSS to 90999 to make a $10 donation.